Five months after the Ford Foundation made Bailey its man in Hanoi in 1997, he went to the central highlands, the locus of heavy fighting during the war. Coming upon a huge pine-tree plantation in a valley, it dawned on him, as an agricultural economist, that the pines had been planted where an entire jungle had once stood. He learned that the valley had been wiped clean by aerial spraying during the war. He thought of Agent Orange, the most common and most toxic of the chemical herbicides applied in vast quantities by the U.S. military from 1961 to 1971. The aim was to destroy all vegetation and thereby eliminate the Viet Cong’s food sources and hiding places. Vietnam’s Red Cross estimates that herbicides cut short the lives or disabled up to 3 million adults and children. And the impact apparently continues with a third generation. The great concern of the Vietnamese has been these children, the offspring of people exposed to the spraying. “Almost 50 years later, babies are being born disabled,” says former Ford Foundation President Susan Berresford. “They’re not even the children of people who were in the war. They’re just children who live in an area where they imbibe the fish or duck or whatever it is that carries this.” Despite the claims, the U.S. government has been highly skeptical for decades of dioxin’s impact on human health. Dioxin is the chief contaminant in Agent Orange. It’s a class of chemicals so poisonous it is tested in parts per trillion and remains toxic for decades. The diseases attributed to it include cancer, heart disease, diabetes, and nerve disorders. At least one generation of Vietnamese children has been afflicted with birth defects, including spina bifida. The Vietnamese also blame dioxin for children born with extra fingers and toes. The more than 2 million American troops in Vietnam who may have been exposed to Agent Orange—how many to a dangerous degree is unknown—eventually won the possibility of aid from Congress. Any Vietnam veteran who later developed any of 14 diseases and conditions is entitled to disability compensation, expected to total $42 billion by 2022. By contrast, the United States offered Vietnam no help in dealing with Agent Orange until a few years ago. A U.S. plane sprays Agent Orange in Vietnam during the war. The more he learned, the more dismayed he became by how his government had muddied the waters and evaded its responsibility for Agent Orange’s aftermath. He grew increasingly aware of the defiled land, lingering dioxin “hot spots,” and the ill health and disabilities among the Vietnamese—the war’s “open wounds,” as a report later put it. Then a U.S. embassy official presented plans to spend $50 million on large-scale testing in Vietnam “to show that the dioxin in people’s bodies came from sources other than the U.S. spraying during the war,” Bailey recalls. The plan went nowhere, but it fired his resolve to do something about Agent Orange. He decided his foundation could go where diplomats feared to tread. He has been walking that fine line between polarized camps ever since. That’s something, considering Bailey spent spent more than three decades as a grant maker for the foundation, working in the Indian subcontinent, the Middle East, and Africa besides Southeast Asia. After graduating from Swarthmore with a history degree, Bailey was a Peace Corps volunteer in Nepal, then picked up an M.P.A. in public policy from Princeton before joining Ford in 1972. He later earned a Ph.D. in agricultural economics from Cornell University. In May, Charles Bailey '67 visited the campus to bring daughter Eliza '14 home to New York for the summer. Photo by Laurence Kesterson. Work did get underway on the three grants Bailey arranged for Vietnam. The first provided wheelchairs, prosthetics, and other help to people with disabilities. Next, Bailey sought to assess all 2,735 former U.S. military bases in southern Vietnam to identify any that still harbored dangerous levels of dioxin. Remarkably, a Canadian study found that dioxin no longer contaminated the soil in landscapes where it had been sprayed. It was concentrated primarily at former U.S. bases where it had been stored and loaded aboard aircraft. The third grant funded a conference at which Vietnamese and American officials finally broke the ice, talking informally about Agent Orange. In 2004, a new American ambassador, Michael Marine, arrived in Hanoi. Marine drew on Bailey’s work to make the case that the United States should do more. He found Bailey’s very different attitude “tremendously important, because at that time everyone else was turning their backs on the issue.” Agent Orange was “a dead issue” until Bailey came along, Marine said, according to Susan Berresford. The turning point came when President George W. Bush visited Vietnam in 2006. For the first time, a joint communiqué between the two countries included a one-sentence mention of “environmental contamination near former dioxin storage sites.” That aside may have been partly prompted by Agent Orange information Bailey gave a Washington Post reporter, whose front-page story about the unresolved issue appeared just days before the visit. But the communiqué steered clear of mentioning Agent Orange or dioxin’s effects on people. The communiqué marked the first official U.S. acknowledgement of the consequences of Agent Orange in Vietnam. But the two countries remained at an impasse concerning what to do about it. So Bailey turned to what’s known as track two diplomacy—arranging for prominent private citizens from both countries to meet and explore how to resolve conflicts concerning Agent Orange. Track two, says Bailey, is “citizen-to-citizen diplomacy to resolve conflict that official channels can’t handle.” Most participants were experts in fields such as toxicology and disability services. Bailey dubbed it the Dialogue Group. It took him more than a year to recruit former ambassador Ton Nu Thi Ninh, vice chair of the National Assembly’s Foreign Affairs Committee, to lead the Vietnamese side. Trusting the Ford Foundation, the Vietnamese asked Berresford to play a role, and she still chairs the group. Bailey recruited author and Aspen Institute President Walter Isaacson to head the American side. The group grew eventually from seven to 11. The Dialogue Group quickly settled on five top priorities: clean up the dioxin hot spots, expand services for people with disabilities, establish a laboratory so Vietnam could test blood and soil samples itself, restore damaged landscapes, understand the disability issue, and publicize the Agent Orange story in the United States. The group has made big strides in all these areas. The second Ford Foundation grant had found dioxin remained dangerous only where 28 American bases had stood. According to Bailey, “herbicides had been stored, leaked, or spilled during handling, so that dioxin soaked into the soil or … into rivers, lakes, and ponds. From there the toxin has moved up the food chain to the fat of fish and ducks and into human tissue.” Three of these sites were especially toxic—the bases at Da Nang and Phu Cat on the coast and Bien Hoa to the south. Most spraying flights were launched from these airfields and when the program ended, unused stocks were collected at Da Nang, Bien Hoa and elsewhere. The area of the Da Nang airport, where drums of herbicide had been stored, proved to be highly contaminated. Breast milk and blood samples from people who previously worked cleaning draining ditches or fished from a nearby lake showed the highest dioxin levels ever recorded among Vietnamese, more than 100 times international limits. Environmental remediation started at Da Nang’s airport. Ford began funding the sealing and cordoning off of contaminated soil, a way to get American and Vietnamese officials to begin working together. As a result, by 2008, dioxin no longer threatened the health of people near the airport. Since then the two governments have designed and financed the cleanup, slated to begin this summer. They also have cooperated in expanded social services for several thousand people with disabilities near the airport. Da Nang is the first place the former enemies have worked together successfully on Agent Orange. The United States also has provided modest funds ($11.4 million) to aid Vietnamese disabled by dioxin and their families. All in all, Congress has appropriated $60 million to deal with dioxin’s aftermath. Bailey spent $12 million of Ford Foundation funds in country and so far has spent $5 million outside to win support from key American groups and raised another $23 million from private and international sources. Still, only an estimated 19,000 to 23,000 Vietnamese with disabilities are being helped. Vietnam itself has not been idle, in fact, “has worked steadily since 1980 to deal with Agent Orange/dioxin remnants on its own,” says Bailey. Hanoi provides $50 million a year in small monthly allowances for people with disabilities believed caused by Agent Orange/dioxin. “Its activities in this area are … avidly reported by Vietnamese news media,” according to Bailey. Vietnam’s Red Cross has raised another $22 million to assist the disabled poor. Severely impaired by dioxin exposure, Nguyen Van Hoai Tan, shown here with his mother, was able to achieve a more highly functioning life after a humanitarian organization stepped in. Bailey has kept on the go outside Vietnam as well, both as an Agent Orange remediation advocate and fundraiser. The formation of the Dialogue Group five years ago gave a big boosts to his efforts to raise money to help the Vietnamese. Since then, the Bill and Melinda Gates Foundation and Atlantic Philanthropies have funded the dioxin-testing lab. 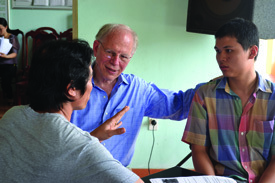 Rockefeller Foundation, Hyatt Hotels, and HSBC Bank have agreed to fund innovative and expanded social services for children and youth with disabilities in Da Nang, forming a public/private partnership. Bailey also has enlisted many civic groups, persuading Rotary, for example, to help fund a clean-water system in a dioxin-contaminated village near the Laotian border. He raised funds for a program that brings 15 college-age Vietnamese-Americans to Vietnam each year to work with nongovernmental (NGO) organizations to help kids and young adults with disabilities. He’s won financial aid from the United Nations and several countries. In addition, he formed a media-strategy team to raise awareness of Agent Orange back home. The results include a focus group and national opinion poll on the subject and seven websites operated by NGOs to do media outreach. One NGO has targeted Vietnam’s worldwide diaspora in pioneering online giving for young Vietnamese with disabilities, while San Francisco State University sent teams of journalists to report on Agent Orange. Their work won many prizes. “He’s planted a lot of seeds,” notes Ellen Schneider, who developed one of the websites. She is impressed by something else. Despite his success, he “is the most humble man I’ve ever known,” Schneider says. She’s also struck by how respectful of people he is. 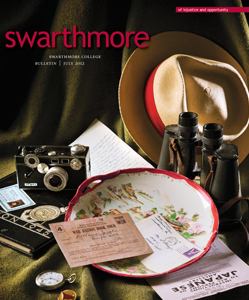 All this may hark back to his days at Swarthmore, where, Bailey says, he was strongly influenced by Quaker tradition. 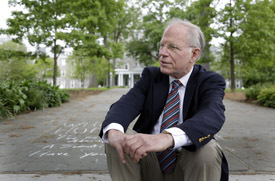 Bailey was on campus at the height of the Vietnam War, which he examined in Professor Kenneth Waltz’s international relations seminar. Concluding Vietnam was not a just war, he joined an antiwar demonstration in Washington, D.C., and considered becoming a conscientious objector. As it happened, when he joined the Peace Corps, his draft board continued his student deferment, and when the lottery replaced the draft, he lucked out with high numbers. Bailey maintains his affinity with the College as the proud father of Eliza ’14 and member of the Parents Council. In 2010, the Dialogue Group proposed a 10-year plan for the two countries, calling for a humanitarian effort to make major inroads against Agent Orange. The plan’s goals are to clean up all the remaining 27 hot spots and restore damaged ecosystems and to expand services to people with disabilities. The plan sets the cost at $300 million and calls on public and private donors to help the United States fund it. No one claims the plan will eliminate the problem completely, which Berresford says probably will take 30 years. Over time the U.S. government has moved closer to this position. Bailey’s Dialogue Group probably has had something to do with this. He likes to say he took the aftermath of Agent Orange “from barren ground to common ground,” from a dead zone to practical action involving Vietnamese and Americans. This no doubt helps explain why last fall Vietnam presented him with its highest honor for foreigners, the Order of Friendship medal.